ePublishing Knowledge BaseePublishing Knowledge BaseePublishing Knowledge Base User Profiles and Registration FormsWhat can my users find on the updated Profile > Purchased Content tab? The updated User Profile, found at https://www.YOURDOMAIN.com/user/profile when the user is logged in, now contains a tab called Purchased Content. It contains a wealth of features that will be useful to you and your readers. the ability to play those files from the website on-demand. We've given you the ability to control a number of items on this page with regard to layout and messaging. As with the other User/Profile tabs, the sidebar can be turned on or off. Learn how to turn the sidebar on or off in this article: How do I turn the right rail on or off on user profile pages? Please note that turning the sidebar on or off impacts the entire User Profile, including the other tabs. Zoom: As with the other User/Profile tabs, the sidebar can be turned on or off. 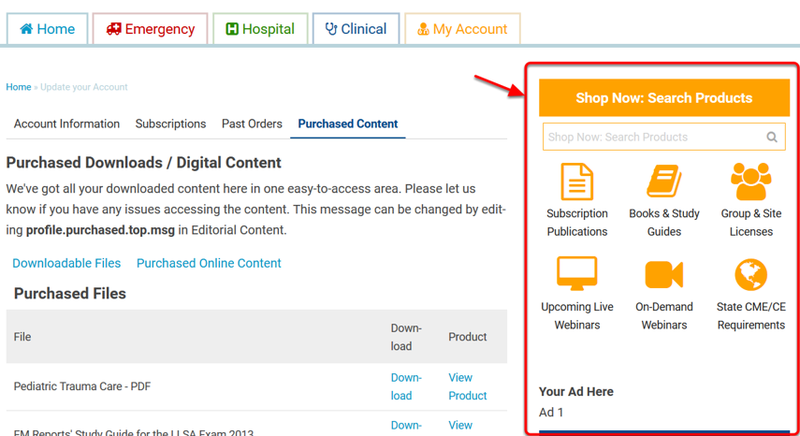 Manage the purchase content message there by editing Editorial Content area profile.purchased.top.msg. This Editorial Content snippet appears below the main header of the Purchased Content tab. You can manage the message there by editing profile.purchased.top.msg. To learn more about editing Editorial Content Zones, read this article: How do I edit an existing Editorial Content block? Note: These sections will only be visible if content of the specific file type has been purchased. Downloadable Files will take the reader to the section of the page where they can download files they have purchased from your website. They may also view the product page. Purchased Video will take the reader to the section of the page where they can download videos they have purchased from your website. They may also view the product page. Possible actions on Audio files. 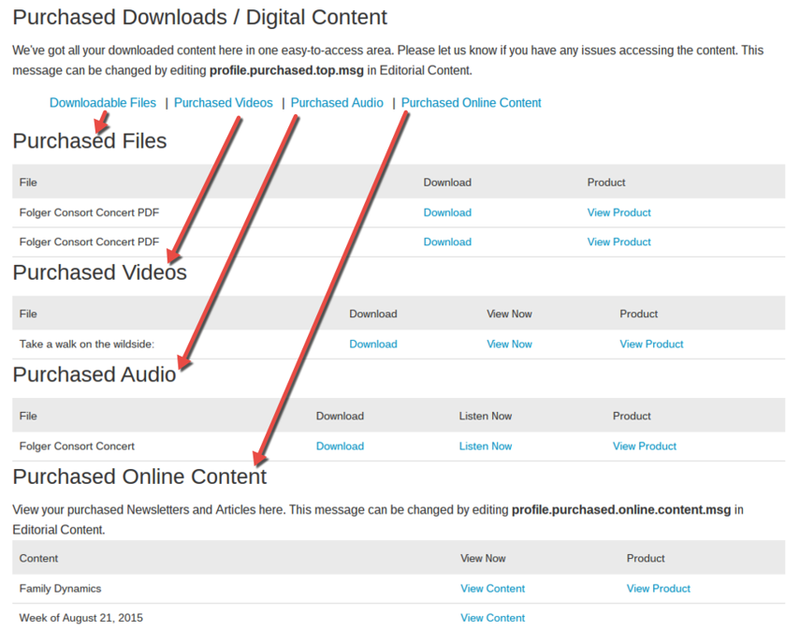 Purchased Audio will take the reader to the section of the page where they can download audio they have purchased from your website. They may also view the product page. Purchased Online Content will take the reader to the section of the page where they may view the content of their purchased articles and newsletters or view the product pages. 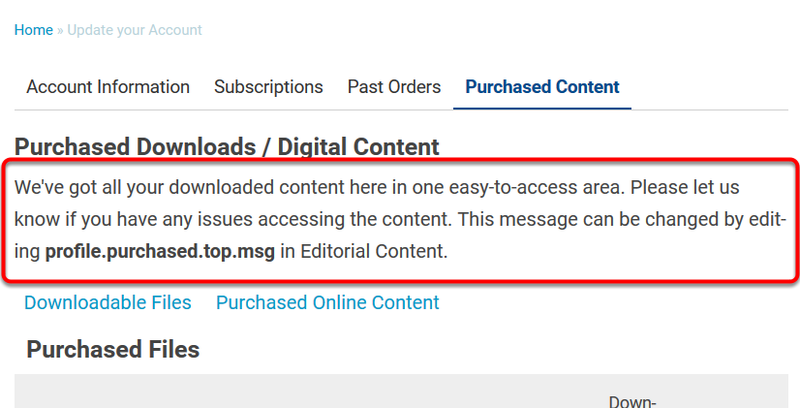 There is an Editorial Content snippet below the Purchased Online Content header that is changed by editing profile.purchased.online.content.msg. Prev: How Are Product IDs Setup in the order receipt? Next: Is it possible to have my logo display on the Invoice page?